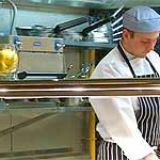 The Restaurant Bar and Grill is located in the heart of Liverpool's bustling commercial district, and is ideal for a business lunch or a relaxing cocktail at the end of a busy day. 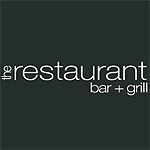 Do you work at Restaurant Bar and Grill? What did you think of Restaurant Bar and Grill? the service is always good, the mezze is a good choice to share and the sweet fig and & goats cheese salad is yummy! The Food and service from staff is 5 star, I recommend the tandoori mixed grill. The building is beautiful and really has to be seen from the inside. The New management however have let this lovely restaurant go down hill, what used to be a friendly charming establishment full of regular diners is now full of scantily dressed girls being leered over by the manager. Such a shame. Fancy posh fish and chips washed down with a proper Martini? Then head to the Restaurant Bar and Grill and get ready to strike a pose. Restaurant Bar and Grill, located on Brunswick Street, is one of the city’s brightest stars. If you're not from Liverpool, or are unfamiliar with street names, this venue could be quite hard to locate but it's worth hunting out as the quality of this restaurant is overwhelming. Stylish brown leather seats that scream comfort surround polished wood tables. One of the most impressive features is the glass shelved wine racks which separate the dining room from the bar. And the cocktail island-bar is just beautiful. It smacks of decadence and is surrounded by tall bar stools which invite you to sit down, join the party, sip cocktails and look cool. 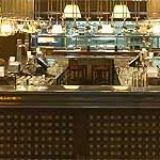 The colour scheme is dark wood and chocolate brown but it bears little resemblance to other high street chains (Ha Ha, Slug and Lettuce) that have used this decor to make their identikit bars look a bit, well you know, cool. No, instead, think New York chic rather than sick proof Ikea. Busy, warm and relaxed are the best words to describe the atmosphere at Restaurant Bar and Grill. The posh surroundings and upmarket ambience make you feel you're having an exclusive, unique experience. Service comes with a huge smile by both waiters and bar staff who seem intent on making you feel welcome. Service like this in England is a bit strange but welcome nonetheless. The Restaurant Bar and Grill attracts the beautiful people who want the finest. If you're not one of these (if don't think you are then you're probably not) don't let this put you off. And if you're wondering where to go on a first date then head here as you'll cool by osmosis. The classic fish and chips with mushy peas, lemon and tartar sauce doesn't sound all that posh (and to most folk it should because it costs £14) but give it a whirl. 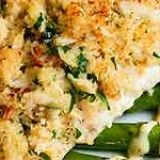 A huge piece of cod nearly covers the plate and tastes absolutely divine and the large serving of chunky chips and mushy peas also live up to expectations. Prices are reasonable to the higher end of the food chain and the most expensive meal costs around £20 for either steak or fish. But the food is blissful and prices are competitive for this area of Liverpool. 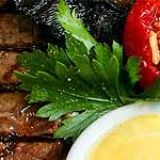 Other meals include pasta dishes, burgers, grilled chicken or fish and the classic meals such as lamb shank and Thai green curry. That beauty of a cocktail bar offers an equally stunning range of drinks with an extensive list of bottled wines and Champagnes. At around £6.50 for a large glass of wine it's more practical to buy the bottle which costs around £16 (house wine). But if you have the cash to splash why not treat yourself to a bottle of fine wine at around £30 to £50? Or if you are feeling really generous there's a list of exclusive Champagnes on offer with 1997 Cristal being the most expensive at £250 a bottle. Whatever drink you opt for you’ll receive the consistently high level of service. With such a bad name this swanky hotspot could easily be overlooked if you're flicking through the phonebook but the Restaurant Bar and Grill is well worth a look. Word is spreading so it's probably best to book a few days in advance.